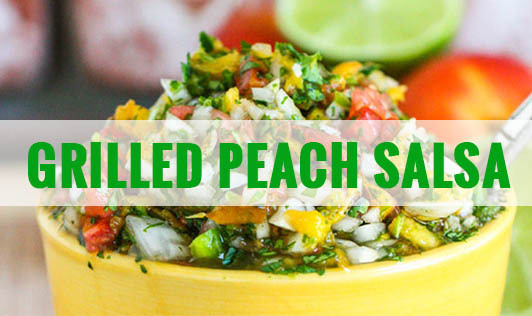 This yummy salsa includes peaches, tomatoes, spring onions, red bell pepper, lime juice, and seasonings, along with sugar or honey, if you like your salsa sweeter. You can serve this flavorful salsa as a snack with cream crackers or khakras. Red Bell Pepper - ½ no. Yellow Bell Pepper- ½ no. • De-seed the tomato and the bell peppers. • Grill the tomato, bell peppers, and peach on a griller/non-stick pan or on an open flame, till their skins are slightly burnt. • Finely chop the vegetables. • Mix all the ingredients together. • Squeeze in the lemon. • Add the fruit juice, freshly-ground pepper, salt to taste, and honey as desired and mix well. • Refrigerate for 40 to 45 minutes. • Serve cold with cream crackers or khakras. Make sure you use a peach that's just ripe, so it is juicy, but still holds its shape.